Published: April 26, 2018 at 08:48 p.m. Updated: April 29, 2018 at 02:48 p.m.
With the first pick of the 2018 NFL Draft, the Cleveland Browns selected Heisman Trophy winner Baker Mayfield out of the University of Oklahoma. Recap the first rounds' top moments from AT&T Stadium during the 2018 NFL Draft. With the first pick in the 2018 Draft, the Cleveland Browns draft, Baker Mayfield out of Oklahoma. Baker Mayfield is the 6th QB the Browns have selected in the first round during the Common Draft Era. None of the previous 5 had a winning record with the Browns or made a Pro Bowl, per NFL Research. Mayfield is the 7th quarterback to win the Heisman Trophy and be selected 1st overall in the Common Draft Era, per NFL Research. Mayfield averaged 9.8 yards per. Highest yards/attempt of any FBS QB in the last 15 seasons (min. 850 pass attempts), per NFL Research. 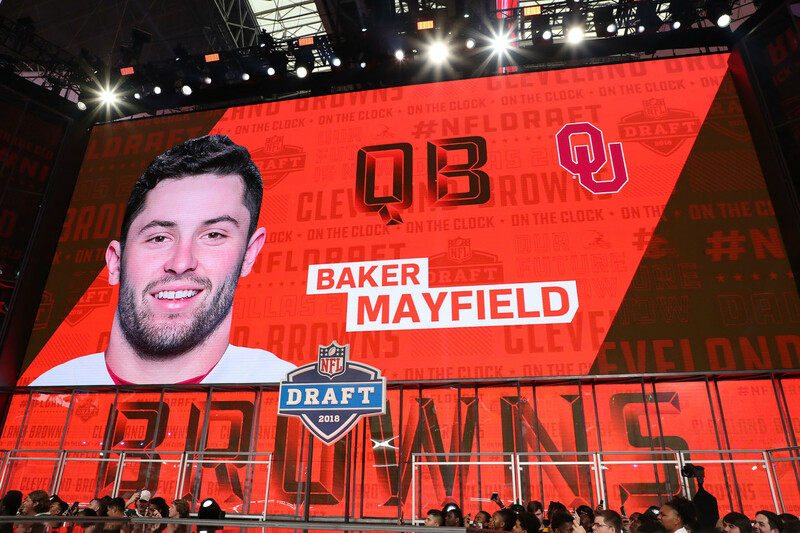 Only 2 quarterbacks in the Common Draft Era have been selected #1 overall despite measuring in under 6-foot-3: Michael Vick (6'0") and Baker Mayfield (6'1"), per NFL Research. Penn State running back Saquon Barkley (right) poses with NFL Commissioner Roger Goodell after being drafted second by the New York Giants. Barkley is the first running back selected by the Giants in the top 10 of the draft in the Common Draft Era, per NFL Research. With the Giants selection of Saquon Barkley, a running back has been selected in the Top 5 in 3 consecutive drafts. The previous two running backs (Ezekiel Elliott, 2016 & Leonard Fournette, 2017) averaged 1,668 scrimmage yards and 13 scrimmage TD during their rookie season, per NFL Research. Saquon Barkley is the first player from Penn State selected in the first round since 2010 (DE Jared Odrick, #28, MIA). First top-10 pick from Penn State since T Levi Brown in 2007 (#5 overall to ARI), per NFL Research. Penn State running back Saquon Barkley (right) greats NFL Commissioner Roger Goodell after being drafted second by the New York Giants. The last running back selected in the Top 2 of the NFL Draft was Reggie Bush, who was drafted #2 overall by the Saints in 2006, per NFL Research. Barkley’s college production compares well with Leonard Fournette & Ezekiel Elliott, the last two RBs to be selected in the Top 5 of the NFL Draft; Fournette: 4th overall in 2017 (Jaguars) out of LSU and Elliott: 4th overall in 2016 (Cowboys) out of Ohio State, per NFL Research. USC quarterback Sam Darnold is drafted thrid by New York Jets. Sam Darnold is the highest-drafted quarterback by the Jets since Joe Namath went 1st in the 1965 AFL Draft and the first player picked in the Top 3 by the Jets since WR Keyshawn Johnson (#1 overall) in 1996 per NFL Research. Darnold is the 5th USC QB drafted in the first round since 1967. Only 1 of the 4 USC quarterbacks selected in the first round in the Common Draft Era went on to make a Pro Bowl (Carson Palmer), per NFL Research. USC quarterback Sam Darnold (right) poses for a photo with NFL Commissioner Roger Goodell after being picked by the New York Jets. Sam Darnold is the 16th quarterback the Jets have selected in the last 30 drafts. None of them have made a Pro Bowl with the team (most QB selections by any team without drafting a Pro Bowler), per NFL Research. Ohio State cornerback Denzel Ward walks on the stage after being drafted fourth by the Cleveland Browns. Denzel Ward is the 4th cornerback to be selected in the Top 4 during the Common Draft Era, and the first since Heisman Trophy winner Charles Woodson went #4 to the Raiders in 1998, per NFL Research. Ward is the 3rd Ohio State player to be selected Top 4 since 2016; DE Joey Bosa: #3 overall to Chargers in 2016 and RB Ezekiel Elliott: #4 overall to Cowboys in 2016, NFL Research. Ohio State cornerback Denzel Ward (right) poses for a photo with NFL Commissioner Roger Goodell on stage after being drafted fourth by the Cleveland Browns. Ohio State becomes the first school to have 4 CBs selected in the first round of the draft in a 3-year span and there have been 7 Ohio State DBs picked in the first round since 2009, per NFL Research. North Carolina State defensive end Bradley Chubb is congratulated by a family member in the green room after being picked by the Denver Broncos. Chubb was a First Team All-American, winner of the Nagurski Trophy & Hendricks Award, ACC Defensive Player of the Year, First Team All-ACC in 2017. Players to win Bronko Nagurski award and be selected in top 6 of the NFL draft: 2018: Bradley Chubb (#5), 2012: Ndamukong Suh (#2), 2008: Glenn Dorsey (#5) and 1998: Charles Woodson (#4), per NFL Research. North Carolina State defensive end Bradley Chubb poses for a photo with St. Jude patient Austin Denton and NFL Commissioner Roger Goodell after being drafted fifth by the Denver Broncos. The last time the Broncos selected in the Top 5, they drafted 6-time Pro Bowler Von Miller #2 overall in 2011. He will be joined on the edge by 2018's 5th overall pick, Bradley Chubb, per NFL Research. Among the N.C. State players selected in the top 5 of the draft in the last 20 years were DE Mario Williams, QB Philip Rivers, and WR Torry Holt, per NFL Research. Wyoming quarterback Josh Allen poses for a photo with NFL Commissioner Roger Goodell after being selected seventh overall by the Buffalo Bills. Josh Allen is the highest-drafted QB in Bills franchise history, per NFL Research. The Bills have drafted 7 quarterbacks (including Josh Allen) since Jim Kelly retired. None of the previous 6 has posted a winning record with the team, per NFL Research. Allen becomes the first 1st-round pick from Wyoming since 1976. The last non-Power 5 quarterbacks to be drafted in the first round were Carson Wentz & Paxton Lynch in 2016, per NFL Research. Penn State running back Saquon Barkley snaps a selfie after being the second overall pick. Georgia linebacker Roquan Smith greats NFL Commissioner Roger Goodell after being picked eight by the Chicago Bears. Roquan Smith is the 4th Top 10 LB the Bears have picked since 1967, including 2018 Hall of Fame inductee Brian Urlacher (#9 overall in 2000). No Bears LB has made a Pro Bowl since Urlacher retired (last Pro Bowlers: Urlacher and Lance Briggs in 2011), per NFL Research. Smith is the 7th LB the Bears have selected in the first round in the Common Draft Era, 3rd LB selected in Top 10, which includes Pro Football Hall of Fame Class of 2018 LB Brian Urlacher (#9 in 2000), per NFL Research. Georgia linebacker Roquan Smith (right) poses for a photo with NFL Commissioner Roger Goodell after being picked by the Chicago Bears. Smith is the first Georgia linebacker selected in the 1st round since Leonard Floyd in 2016 and first top-8 pick from Georgia since A.J. Green went #4 overall to CIN in 2011, per NFL Research. UCLA quarterback Josh Rosen poses for photos after being selected 10th by the Arizona Cardinals. Josh Rosen joins Troy Aikman as the only UCLA quarterback to be selected in the top 10 of a draft in the Common Draft Era, NFL Research. UCLA quarterback Josh Rosen gestures to the crowd after being selected 10th by the Arizona Cardinals. A general view as the Arizona Cardinals select UCLA's Josh Rosen during the first round of the NFL football draft. Alabama defensive back Minkah Fitzpatrick walks on stage after he is selected eleventh by the Miami Dolphins. Minkah Fitzpatrick is the highest the #Dolphins have selected a safety in the Common Draft Era, and the 2nd safety the team has selected in the first round during that span (Louis Oliver, #25 overall in 1989), per NFL Research. In 2017, Fitzpatrick joined Charles Woodson (1997) and Patrick Peterson (2010) as the only players in college football history to win both the Jim Thorpe Award (nation’s best DB) and the Chuck Bednarik Award (nation’s best defender), per NFL Research. Fitzpatrick is the 7th Alabama defensive back selected in the first round since 2010, per NFL Research. Washington defensive tackle Vita Vea talks on the phone in the green room before being selected twelfth by the Tampa Bay Buccaneers. Vita Vea is the 3rd defensive tackle the Buccaneers have selected in the Top 12 of the NFL Draft in the Common Draft Era. The other two: 6-Time Pro Bowler Gerald McCoy (#3 overall in 2010) and Hall of Famer Warren Sapp (#12 overall in 1995), per NFL Research. Washington defensive tackle Vita Vea is interview by NFL Network analyst Deion Sanders after being picked 12th by the Tampa Bay Buccaneers. Vea is the 5th defender from Washington picked in first round since 2013, per NFL Research. UTSA defensive end Marcus Davenport in the green room before being selected fourteenth by the New Orleans Saints. The Saints have drafted 3 defensive ends in the first round in the last 15 years, including Marcus Davenport. The other two (Cameron Jordan, #24 overall in 2011 & Will Smith, #18 overall in 2004) each went on to become Pro Bowlers in New Orleans, per NFL Research. The Saints have selected a defensive player in the first round in 4 straight drafts: 2018: DE Marcus Davenport (14th overall), 2017: CB Marshon Lattimore (11th),2016: DT Sheldon Rankins (12th), 2015: LB Stephone Anthony (31st), per NFL Research. Davenport is the first 1st-round pick from UTSA. The UTSA football program started in 2012 (6 seasons in existence), per NFL Research. UCLA offensive tackle Kolton Miller (right) poses for a photo with NFL Commissioner Roger Goodell after he is selected by the Oakland Raiders. Kolton Miller is the first OT from UCLA to be selected in the first first round since Jonathan Ogden in 1996, per NFL Research. Virginia Tech linebacker Tremaine Edmunds high fives fans on stage after he is selected by the Buffalo Bills at 16. Tremaine Edmunds is the first linebacker Buffalo has selected in the first round since drafting Shane Conlan #8 overall in 1987. Conlan went on to win the 1987 Defensive Rookie of the Year and earned 3 Pro Bowl selections, per NFL Research. Virginia Tech linebacker Tremaine Edmunds snaps a selfie with Buffalo Bills fans after being selected 16th overall. Edmunds is the first Virginia Tech linebacker selected in the 1st round in the Common Draft Era (since 1967), per NFL Research. Edmunds is the first LB the Bills have taken in the first round since 1987 (31 years), per NFL Research. NFL Commissioner Roger Goodell greets Florida State safety Derwin James on stage after he is selected 17th by the Los Angeles Chargers. James was a Second Team All-American and First Team All-ACC in 2017. Each of the last two FSU defensive backs selected in the first round has become a Pro Bowler (Jalen Ramsey & Xavier Rhodes). In addition, there have now been 9 DBs from Florida State selected in the first round since 1989, when Deion Sanders was selected #5 overall by the Falcons, per NFL Research. NFL Commissioner Roger Goodell and Louisville cornerback Jaire Alexander reacts on stage after he is selected 18th by the Green Bay Packers. The first Packers have selected a defensive player with each of their last 6 round picks (Green Bay did not have a first round pick in 2017), per NFL Research. In 4 of the last 5 drafts, at least one Louisville player has been selected in the first round, per NFL Research. Former Dallas Cowboy wide receiver Drew Pearson on stage before the Dallas Cowboys pick. Dallas Cowboys executive vice president Jerry Jones Jr. (left), head coach Jason Garrett (center) and owner Jerry Jones (right) talk during the 2018 NFL draft in the team's draft room at Cowboys headquarters at Ford Center at The Star in Frisco, Texas. Boise State linebacker Leighton Vander Esch on stage after he is drafted 19th by the Dallas Cowboys with NFL Commissioner Roger Goodell. Vader Esch was the Mountain West Defensive Player of the Year in 2017. Vander Esch is the 5th first-round pick from Boise State in school history, per NFL Research. Alabama linebacker Rashaan Evans on stage after being selected 22th by the Tennessee Titans. Rashaan Evans is the first linebacker selected in the first round by the Titans since Keith Bulluck (#30 overall) in 2000. Bulluck was a 1st-Team All-Pro selection in 2003, per NFL Research. vans is the 8th LB from Alabama selected in the first round since 1989, 5th LB from Alabama selected in the first round in the last 9 drafts, per NFL Research. Pittsburgh Steelers linebacker Ryan Shazier walks on stage with his fiance Michelle Rodriguez to present the Pittsburgh Steelers' 28th pick. Pittsburgh Steelers linebacker Ryan Shazier (left) and NFL Commissioner Roger Goodell pose with Virginia Tech linebacker Terrell Edmunds on stage after he is selected 28th by the Pittsburgh Steelers. Tremaine Edmunds and Terrell Edmunds are the first brothers in NFL history to be drafted in the first round of the same draft, per NFL Research. The Steelers have used their last 6 first round picks on defensive players. Edmunds is the first safety selected in the first round since Troy Polamalu in 2003, per NFL Research. Florida defensive tackle Taven Bryan on stage after he is drafted 29th by the Jacksonville Jaguars with NFL Commissioner Roger Goodell. A Florida defender has now been selected in the first round in each of the last 6 drafts, per NFL Research. Louisville quarterback Lamar Jackson sits in the green room waiting for his name to be called. Jackson was picked 32nd by the Baltimore Ravens. Jackson is the only QB with multiple seasons of 3,000+ passing yards and 1,000+ rushing yards in FBS history (from a Power 5 conference), per NFL Research. In the last 10 drafts, 18 running backs have been selected in the first round (including 3 this year), Jackson (4,132 career rush yards) had more career rush yards than 17 of them (Melvin Gordon: 4,915 rush yards at Wisconsin), per NFL Research. Louisville quarterback Lamar Jackson greets NFL Commissioner Roger Goodell on stage after he was selected 32nd by the Baltimore Ravens. Lamar Jackson joins Teddy Bridgewater (2014) as the only Louisville quarterbacks selected in first round in the Common Draft Era. Both were selected with the last pick of the first round (32nd overall), per NFL Research. This is the third time 2 Heisman Trophy-winning QBs were selected in the same draft in the common draft era, per NFL Research. The newest NFL players pose with family at the Prospects Family Portraits studio after being draft. In the Common Draft Era, only two teams have selected multiple Hall of Famers in the first round of the same draft. Ravens in 1996: Jonathan Ogden & Ray Lewis and Buccaneers in 1995: Derrick Brooks & Warren Sapp, per NFL Research. There more quarterbacks (5) selected in the first round of the 2018 Draft than any other position. Four teams traded up to select a quarterback, per NFL Research. The 2018 Draft was the first time since 2010 that no WRs were selected in the Top 20, per NFL Research. A look into Draft Rooms around the League. (Top L-R) Green Bay Packers, Atlanta Falcons, New Orleans Saints. (Bottom) San Francisco 49ers, Jacksonville Jaguars, Minnesota Vikings, Indianapolis Colts. Dallas Cowboys quarterback Dak Prescott on the NFL Network set before the start of Day 2. Central Florida linebacker Shaquem Griffin (left) and Seattle Seahawks cornerback Shaquill Griffin pose for a photo in the green room. Cleveland Browns Hall of Fame running back Jim Brown announces the Browns second round pick Austin Corbett, guard, out of Nevada. Iowa cornerback Josh Jackson (center) is select by Green Bay Packers in the second round, the 45th overall pick. The pick was announced by Hall of Fame offensive lineman Jerry Kramer. Former Philadelphia Eagles kicker David Akers announces the Philadelphia Eagles selection of Dallas Goedert out of South Dakota State with the 49th overall pick. Akers heckled the Dallas Cowboys pro crowd saying, ""Hey Dallas, they last time you were in a Super Bowl these picks weren't even born yet!" Texas offensive tackle Connor Williams receives the call he was selected by the Dallas Cowboys with the 50th overall pick. A look into Draft Rooms around the League. (Top L-R) Cleveland Browns and Tampa Bay Buccaneers. (Bottom) Denver Broncos and Miami Dolphins. (L-R) Pittsburgh Steelers Hall of Fame defensive back Rod Woodson, Los Angeles Chargers Hall of Fame running back LaDainian Tomlinson, Former Atlanta Falcons quarterback Michael Vick and Former Detroit Lions wide receiver Nate Burleson announce their teams' draft picks in the second round. Past recipients and team winners of the Walter Payton NFL Man of the Year Award on stage at the start of round 3. Central Florida linebacker Shaquem Griffin and his twin brother, Seattle Seahawks cornerback Shaquill Griffin on stage after Shaquem is drafted by the Seattle Seahawks during the 2018 NFL Draft on Saturday, April 28, 2018 in Arlington, Texas. Central Florida linebacker Shaquem Griffin celebrates with Seattle Seahawks fans during the 2018 NFL Draft on Saturday, April 28, 2018 in Arlington, Texas. Australian rugby player Jordan Mailata is drafted by the Philadelphia Eagles in the seventh round during the 2018 NFL Draft on Saturday, April 28, 2018 in Arlington, Texas. NFL fans cheer during the draft.